Smoke_Letter_OpenEnd_Plastic_Envelopes-975x1175 is rated 5.0 out of 5 by 1. Do these have any type of expansion for the Smoke Button and String Envelope? Thank you! Smoke Letter Open Ended Plastic Envelopes are the perfect envelopes for when you want to look and stay professional, when you want your papers to stay protected, and when you want your office to stay organized. Our Smoke Grey 9 3/4 x 11 3/4 Envelopes will fit your standard sized papers without bending or ruining it in the process. So when you slip our your resume, presentation, or essay, it will look as good as when you put it in! You even have five different shades to choose from! From an admirable amber to a minty frost exterior to a classic smoke grey. 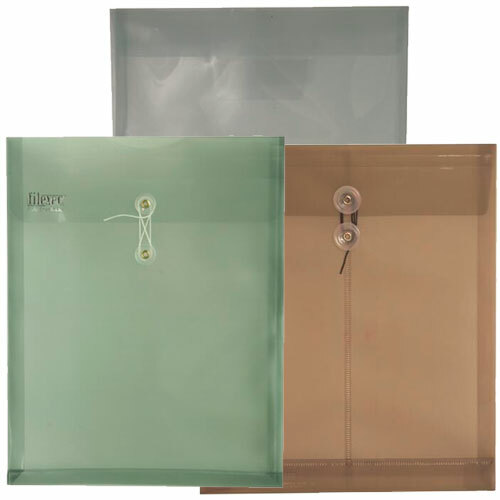 Open Ended Plastic Envelopes are the perfect organizer for the office, home, school, wherever! Smoke Letter Open Ended Plastic Envelopes measure in at 9.75 x 11.75, are available in five different smoky shades and two different closure styles – button and string or tuck flap. Whether you want one for yourself or want a bunch for the office, we sell these envelopes individually or in bulk!